Female Vasas in breeding condition lose feathers on their head and crown and the skin becomes bright yellow, giving the bird a vulturine appearance. C.v. vasa: Male-grey/black, more grey on upperparts; grey undertail coverts, shafts of feathers streaked black; outer webs of primary feathers blue/grey; brown/black tail, grey underneath. Bill pink/horn coloured. Lores and eye ring bare and pink/white. Eye dark brown. Female-as in male but when breeding loses feathers from head to reveal yellow/orange skin. 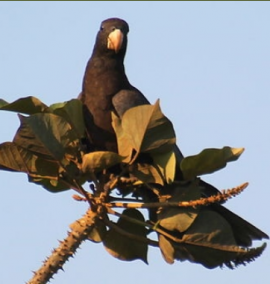 C.v. drouhardi: Both adults paler, more blue/grey on upperparts; grey/white undertail coverts and underside of tail; tail with darker subterminal band; smaller in size. C.v. comorensis: Both adults paler in colour; brown tinged underparts; undertail coverts grey/brown with shafts streaked darker; smaller in size. As in adult but more brown plumage; feathers of underparts marked chestnut brown. Bill grey. Cere, lores, and eye ring bare and pale grey. Wide range of sounds. Whistling, puppy-like yapping, harsh squawks, raucous calls, and vibrating, grating sounds. Walk-in aviary, minimum length 7m (23 ft). Fruit such as: apple, pear, orange, banana, cactus fruits, pomegranate, forming about 30 % of the diet; fresh vegetables such as: carrot, celery, green peas, beans, fresh corn, green leaves; spray millet and limited mixed seed; cooked beans and pulse; complete kibble; walnuts. Horizontal box, 16" x 16" x 48" (40.6cm x 40.6cm x 122cm). Hunted for food. Officially treated as a harmful species due to predation of crops. Also trapped for wild bird trade, and threatened by habitat loss. C.v. comorensis: Comoro Islands, Moheli and Anjouan. Inhabits variety of habitats from moist dense forest to open dry woodland and savanna, to cultivated areas and inhabited areas. Up to 1000m (3280 ft). Consumes seed, nuts, berries, fruits; cultivated maize, rice and millet. Congregates in noisy parties and in larger flocks when feeding or roosting. Roosts in tops of tall trees with a lookout to warn of danger. Active on moonlit nights. 3 to 4 slightly elliptical eggs, 46.0 x 34.0mm (1.8 x 1.3 in).